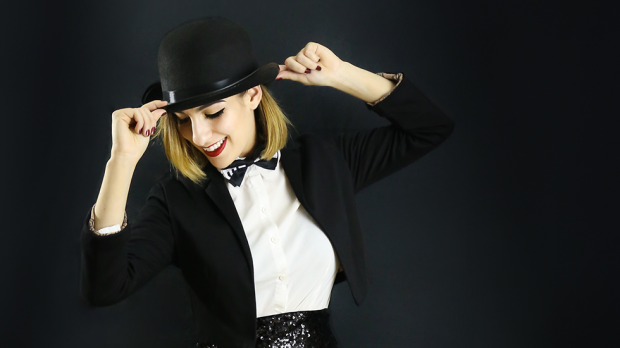 Spotlights, bowler hats, bow ties, leotards and ‘all that jaaaazzzz’ will be celebrated unabashedly at FRINGE WORLD’S Kiara with a K, starring Kiara Macri, one-third of the talented Macri sisters who happen to all be stars in their own Fringe shows. 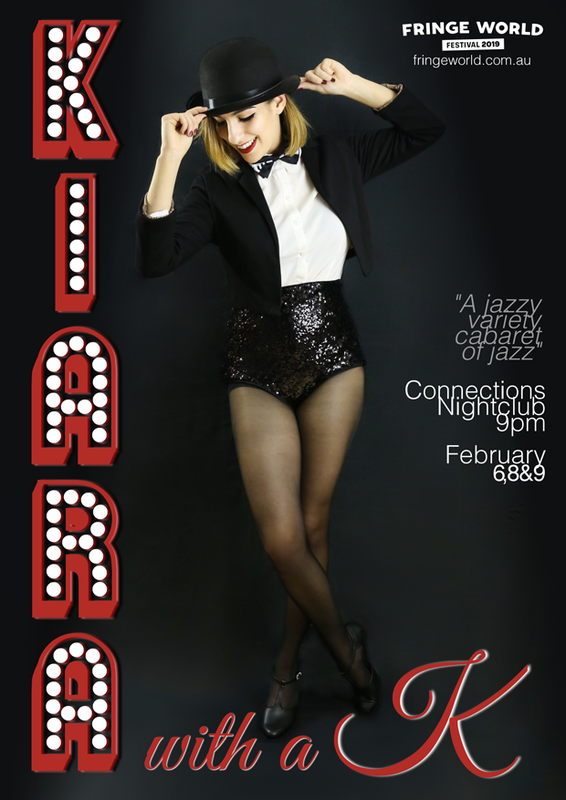 Kiara with a K will be a cabaret showcase for Kiara’s gifts for singing, storytelling, musical theatricality and flair for drama, as sisters, Nicola and Alysha (aka Veruca Sour), join her on stage at 9:00pm on Wednesday February 6, Friday February 8 and Saturday February 9 at Connections Nightclub. In between her busy schedule as a teacher and manager of West Coast Music School, Kiara Macri paused to chat to CHERYL LIM about her love of glitter and Liza Minnelli. You must be a fan of Fosse, Minnelli, bowler hats, glitter, bow ties and leotards and fish net stockings. How did the fascination for cabaret start for you? How can you tell!? I think I was just drawn to the whole aesthetic as a kid. The classic silhouette under a spotlight and that vaudeville flair just looked so cool to me and I always wanted to emulate that style. I love the whole background behind Fosse’s choreography; being told he couldn’t be a ballet dancer and creating a whole dance empire in protest. Then dream team Kander and Ebb plus Liza Minnelli just wraps everything up in a nice glittery bow. Who would you say inspires you the most in the glamorous world of cabaret? It’s gotta be Liza with a Z herself. I can’t even remember hearing about her or watching one of her performances for the first time, it’s like she’s been a part of my psyche, shaping me since day one. What I love the most about Liza is that when she’s on stage she’s not there to say “Hey, I’m the best at this and look how good I am at all these things!” She’s there to say “I love doing this, and I’m here to share it with you.” She just oozes passion and sincerity and that’s what I aspire to be like above all else. Coming from an Italian family and having sisters who are all starring in their own FRINGE WORLD shows this year: Veruca Sour who is a local Perth Burlesque star performing in Sugar Blue Shakedown and Instinct, and Nicola Macri, a talented comedian who stars in The Hilary Duff Re-enactment Festival, how does it feel to have them performing alongside with you in Kiara with a K? It’s incredibly gratifying and I feel luckier every day. The best part is that although we are all performers, we don’t clash or feel the need to compete. We are all in different avenues of the performing arts and it means we can work well as a team. Alysha (Veruca) never stopped being the guinea pig of the family as the eldest. She had to build herself from the ground up and learn everything as she goes. She’s truly paved the way for me and is full of experience and advice. I get to learn from what she’s been through and meet the people that she knows and I would not be in the position I am in without her. Then there’s Nicola who is an absolute beacon of support and encouragement, with brains for days. She’s also our resident photographer, designer and comic relief (and the only one with a degree). It’s very handy having her around. Even if she wasn’t related to me I’d still want to work with her. As for my family; I come from a long line of female powerhouses who have always made me feel like I can achieve absolutely anything. Having my sisters in this show makes me feel entirely secure, safe and supported. Apart from our dance concerts when we were kids and the regular Lounge Room shows we put on for our parents, we’ve never actually performed together, which is hard to believe! There’s also a bunch of ‘Honorary Macris’ in this show, all of whom are wonderful friends and incredible people. You were practically ‘born with dancing shoes’ on your feet, and started dancing at the age of two, then trained in jazz, tap and ballet. Apart from dance, you also trained vocally in a range of genres from jazz, musical theatre through to classical and pop. Growing up, you even played several instruments. Were you always naturally passionate about performing or would you say that your family played a big part in nurturing your talents? I think it all started because my parents ended up with such a loud and energetic child that they had to shove me on a stage just to shut me up. Being the youngest, I think I mostly just copied what Nicola and Alysha were doing for a while until I found my feet. My parents have always given us so much freedom to try new things and have encouraged us to do what we love no matter what. It means that Dad never ended up with the soccer player he wanted but he got three performers instead. I don’t think he’s complaining though, he’s never shied away from telling us how proud he is. I’d listen to Pavarotti with him before I could talk and he stops whatever he’s doing to come listen whenever I play the piano. As for mum, not only has she sewed our costumes, come up with the money to pay for our tuition, driven us to every class and concert and housed us right into adulthood, but she’s also made sure we stay grounded. I simply don’t value being the best at what I do. I value the opportunities I have to do it, and the people I have to support me. You’re now managing West Coast Music School and teaching singing and piano as well as running the school choir. How do you find the time to also develop yourself as an artist and performer while managing and teaching? Any advice for artists who are struggling to find the time to develop their artistic career as well as hold down a 9-5 job? Not a lot of people get to say they genuinely love their job, and that’s because they don’t work for West Coast Music School. I don’t have to work a 9 – 5 office job and I feel very lucky to have been given the opportunity to share my passion for music with a bunch of wonderful people; colleagues and students alike. Being a music mentor gives me a lot of flexibility and I guess it makes it relatively easy for me to find the time to create new things and pursue my performing career because I’m surrounded by music every day. I do have to be very efficient with my time, and also learn to say no to things and prioritise self-care. As for advice for artists: basically, work for a business that you believe in and supports you in return. I really hate the notion of having to work yourself to the bone and hate your job because that’s ‘how life is’. It shouldn’t be. Can you tell us what we can expect when we head down to Connections Nightclub on 6, 8 or 9 February to check out Kiara with a K? Jaaaaaaaazzzzzz. Nice ladies who all have my mother’s approval and also a boy called Sven. There’s tap dancing, burlesque, comedy, singing and, say it with me: jaaaaaazzzz. I feel like I’ve been preparing for this show my whole life. The routines have been choreographed and the costumes have been designed in my head for years. The magic of FRINGE WORLD is that you get to make your own opportunities to put on the shows of your dreams. I’m so excited to see it become a reality with this cast; everyone’s so good at what they do and audiences are going to get a real treat in seeing a bunch of very talented artists having a genuinely good time on stage.